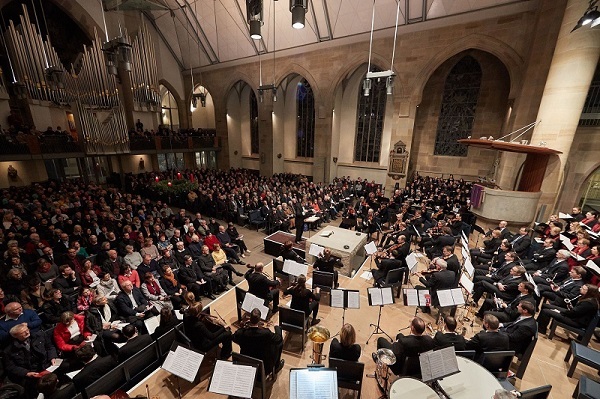 The end of this year's music year was once again the Quempas singing of the Bosch music groups on December 13th in Stuttgart's Stiftskirche. Ulrich Waldörfer has conducted the main work of the concert with the strongly cast Bosch Choir and active members of the Philharmonic Choir Heilbronn for almost 25 years. This time again he surprised the audience with something new. Instead of just one oratorio, he chose two large-scale works for choir and orchestra for the program:"Magnificat" and the cantata "Vom Himmel hoch" - both written by Felix Mendelssohn Bartholdy. Under the impression of his great role model Johann Sebastian Bach, he wrote the Magnificat at the age of only 13 years. Ten years later he composed "Vom Himmel hoch". In Mendelssohn's "Magnicifat" roles, the choir, orchestra and soloists (Melanie Dreher, soprano, Jasmin Hoffman, Alt, Daniel Schmid, tenor and Nikolaus Fluck, bass) were challenged and excelled with their performances. In between, the almost romantic orchestra suite No. 3 in D major "Air". Interpreted and conducted by Hannes Reich, the conductor of the Bosch Symphony Orchestra. Also participating this time, the Bosch brass players under the direction of Kerstin Schatz with the American hymn "Great Is Thy Faithfulness". Bosch-Quempas also includes the fact that, following the old Latin song "Quem pastores laudavere" - which the shepherds praised - the choir of four groups and alternately sung from the four corners of the church - is once again sung by the lower school choir of the Waibling Salier-Gymnasium. With "Oh, you cheerful, sung by the singers of the choirs, the student choir, all soloists, the Bosch symphony orchestra and the audience this atmospheric, pre-Christmas concert evening ended. It is now a good custom that the entire proceeds from the sale of tickets are donated to the Primavera donation account. This year, 7,787 euros can be added to the account. In November 2016 Mr. Grosch (member of Primavera board) visited Chiguru Center to get an impression of the center in general and to see what happened to the donations collected on Betterplace.org. He met the boys who were directly supported by this project and also had the chance to talk to the parents of the two boys who received the hearing aids and therefore were able to hear for the first time of their lives. They expressed their greatest thanks to Primavera. Mr. Grosch returned highly motivated to keep supporting the Chiguru Center and with a very positive impression of how the money was used to help these children in offering them a way to a self-determined life. There is still money needed to finance health and educational needs of this project. Christmas is coming soon and every one is starting to shop for christmas presents. Nowadays we often order the presents via Internet. At the same time there are many countries in which children neither have minimum amount of money to buy food and clothes nor do they have christmas presents. If you shop for you christmas presents via www.schulengel.de you can directly support Primavera projects for children. The shop will donate 2-10% of the value of your purchase to Primavera. On the 08th of November this year the charity concert of the Bosch symphony orchestra took place under the direction of conductor Hannes Reich. DS/P and patron of the event Uwe Gackstatter provided with his humorous words at the beginning of the concert for good mood. But also the important and beneficent purpose of the charity concert was not forgotten. All Bosch associates as well as their families and friends were invited warmly to the free concert. About 400 concert-goers listened in in the canteen reshaped to the concert hall Fe412 / 1 to the varied programme of the Bosch Symphony Orchestra. With the concert in A major for violin and orchestra of Wolfgang Amadeus Mozart Traudel Reich impressed as solo violin. Besides a lot of applause, conductor Hannes Reich, concert master Magdalene Iseli as well as soloist Traudel Reich received a bouquet in recognition of her engagement. The concert revenues from voluntary donations went to the social organisation Primavera which was founded about 25 years ago by Bosch associates. On Thursday 17.11. In 2017 the donation check handing over occurred through patron Uwe Gackstatter to Mr. Krieger, and treasurer of Primavera who accepted the cheque in the name of Primavera thankfully. Now better chances to survive should be given to children from slums and Favelas in Bosch sites in developing countries by the donated revenues. The proud donation result of 3.457, 13 EUR was joyfully accepted by Mr. Kriefer. He thanked once again all partners and coorganizers of the charity concert for her extraordinary engagement. As part of the "Me gusta mi escuela" ( "I like my school") Primavera is involved this year in a global pilot project - a German-Mexican cooperation of Bosch employees in Mexico.The objective of this cooperation is to have the Bosch team working on site in Mexico concretely and "hands-on" in a school while the colleagues in Germany raise the necessary resources. These circumstances provide very limited opportunities for the future for the children and the German-Mexican Bosch team is committed to providing support for school supplies, tutoring and homework help, advanced programs and scholarships. In focus will be the specific commitment of Bosch Mexico employees in supporting the primary school and ensuring the sustainability of the project for the future. Please use this wonderful opportunity to actively support this pilot project with your donation on betterplace.org. The performers came from Bengaluru, Nashik and Jaipur. Their dances and songs were rooted in the rich cultural heritage of various Indian regions and languages. Their costumes reflected almost every color of the rainbow – which was apt, since the theme of the Spark of Joy Season 2 was the rainbow or “Indradhanush” as it’s known in Sanskrit. The aim of the event, held on the evening of August 7, 2016, was to raise funds for Primavera India so it can support the work of 10 trusts across the country that help underprivileged children realize a better quality of life. The evening was defined by the sight of Bosch associates from across locations coming together to battle childhood poverty and need. The fierceness of commitment was apparent – whether in the battle cry of the Maratha warrior that rang through the dhol tasha performance of the Nashik plant Bosch associates or the mythic resonance of the troupe of Yakshagana performers from Bosch Bengaluru or the twirling, delirious dance of Jaipur employees performing the kalbeliya. And it was not just Bosch associates who shone on stage. Bright young children from the Prasanna Trust and Ashraya Foundation – two organizations supported by Primavera for the work they do in helping needy children get access to quality education and a better life – put on show-stopping performances as well. The popular stand-up comedian Ashwin Mathew was also a star guest performer, cracking jokes about growing up in 80s Bengaluru (a nostalgic walk down memory lane punctuated by guffaws of laughter for many in the audience). Spark of Joy Season 2 built on the foundations laid in 2015 when the first two events aimed at raising funds for Primavera India were held. 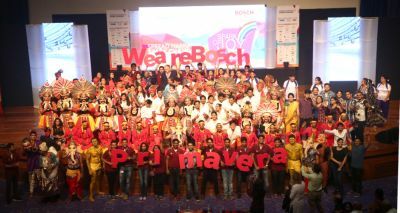 Those events, too, were a result of cooperation across Bosch India business divisions and the hard work of volunteers. For the second edition of Spark of Joy, the work that went behind the scenes itself tells how much effort was required to put on this hugely successful show: 120 performers, more than a month of rehearsals to get every step right, more than 30 volunteers. And of course, prior to that tickets to the event were sold both through an online ticketing system (a first for Bosch India) and offline through ticket coordinators across locations. INR 365700 = 4.885 EUR. All these sales proceeds will go to benefit the organizations supported by Primavera India. Now in its 26th year, Primavera is an organization that is driven by the hard work of Boschlers united by a desire to rid the world of childhood poverty. “I believe the children are our future - teach them well and let them lead the way,” sang George Benson way back in the 70s. This is Primavera’s belief as well and its role in transforming the lives of thousands of children for the better underscores the importance and success of its mission. Associates showed an enormous commitment: In the course of the fundraising campaign in Europe that lasted almost two months, 410,000 euros were raised for the aid organization Primavera run by Bosch associates. As had been announced, the company matched this sum. The total figure of 820,000 euros will flow into charitable projects. A six-member committee comprising representatives of Primavera, the combined works council, the group executives’ committee, the office for coordinating refugee aid, and the Corporate Citizenship department decided on the allocation of funds. “We had a six-hour meeting at which we openly and constructively discussed each of the proposals submitted – and, in the end, we came to a unanimous decision,” says Sabine Lutz of the Corporate Citizenship department. All members of the committee were impressed with the commitment, the diversity, and the creativity with which the many volunteers are helping refugees and supporting their integration. Of the 185 proposals submitted, 113 projects were selected. Pivotal factors underlying the decision included the long-term viability of projects, but also the voluntary involvement of Bosch associates along with a balanced regional distribution. The fields of action of the aid projects are diverse. 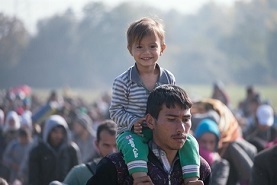 Most initiatives aim to support the integration of refugees. That includes the organization of language courses, leisure and sports activities, or accompanying refugees on appointments with public authorities. Financial assistance is also dedicated to direct disaster relief, including medical care for refugees at a clinic at the border between Syria and Turkey. Every day, as many as 300 patients are treated here free of charge and provided medication. Patients mainly include older people, women, and children. The donations approved will cover the medication needs for roughly six months. Successful integration through education for roughly 500 young refugees – that is that aim of an “Education campus”, a project of the foundation Bürgerstiftung Stuttgart in collaboration with roughly 15 institutions, organizations, and companies, including Bosch. The company had already made 500,000 euros available for integration initiatives at the end of last year. This will allow the creation of roughly 400 additional career-oriented internship places for refugees at 30 Bosch sites in Germany. Result of appeal for refugee aid! On December 4th 2015 Robert Bosch GmbH and Primavera in close collaboration have asked Bosch employees and Primavera friends for donations for sustainable aid to refugees. Thereby, Robert Bosch GmbH offered to double the donations made by employees and Primavera friends until January 31st 2016. Finally, about 410,000 Euro have been collected on the Primavera refugee’s fund which makes the great sum of 820,000 Euro including the Bosch contribution! The allocation of funds will happen in regards to the Primavera philosophy and in close collaboration with Bosch: All donations will support non-profit organizations in vicinity of Bosch locations, ideally even in projects in which Bosch employees are already engaged. Focus of donations from the Primavera fund is on first-aid (meaning Health and Food), while focus of Bosch is on supporting the following phases of integration of refugees (Sports, Culture, Preparation for work environment). Additionally, we will integrate Bosch employees in the allocation of donations. They are supposed to make proposals which will be approved by a committee comprising representatives of Bosch, Primavera and employees. Coordinated by a specifically nominated refugee coordinator, Bosch will start further activities and therefore secure the future sustainability of the donation campaign. Herewith, the Primavera board would like to explicitly thank you all for your formidable support. Only with your support and by your engagement are such impressing and useful activities possible at all.